The PWR-ARM II is a must for any pontoon or deck boat. 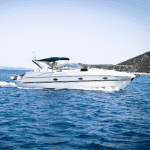 With the flip of a switch or push of a button, you can easily deploy the Bimini top. Our loyal customer, Mr. Ed, installs them for many customers in his area that are looking to upgrade their boat. He removes broken and damaged frames and installs the PWR-ARM. Check out the transformation. His customers are surely pleased with the results. In some cases, additional coverage may be preferred while your family is out on the water. If you have the space, it is an awesome idea to double up. Yes, that’s right! Adding two PWR-ARMs is very popular and provides great satisfaction for everyone on your boat. Easy to install and a pleasure to use, the PWR ARM takes your Bimini top use to an entirely new level. Sit back and relax at the push of a button! 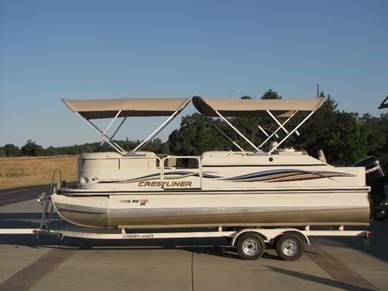 Ready to add a top to your boat, email info@boatcoversdirect.com or call us at 866-626-8377 with any questions! Previous: Bimini Tops- an important addition!